The Chattanooga Mocs won a back and forth battle against The Citadel, Saturday in Charleston, 29-28 with a bit of trickery in overtime. 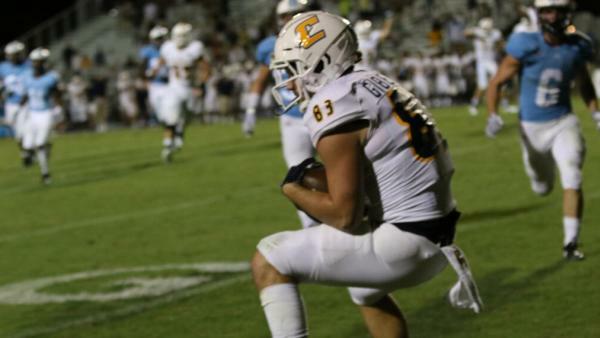 The Chattanooga Mocs won a back and forth battle againstThe Citadel, Saturday in Charleston, 29-28 with a bit of trickery in overtime, but it didn’t look as if it was going to get to that stage in the game. Chattanooga jumped out to a quick 14-0 first quarter lead, a 76-yard touchdown pass from Nick Tiano to Bryce Nunnelly and a 16-yard run by Tyrell Price, before the Bulldogs got their game in gear. It was the second straight week The Citadel fell behind by two scores right out of the gate. The Bulldogs got on the board in the second quarter after a 12 play, 66-yard drive capped off by a Jordan Black 3-yard touchdown run. After another Tiano to Nunnelly touchdown pass, the Bulldogs scored three straight touchdowns to take a 28-21 lead after their possession in overtime. The Mocs answered in their overtime frame and coach Tom Arth showed no hesitation deciding to go for the win on the road. Cue the Razzle Dazzle…a Nick Tiano to Bryce Nunnelly lateral who then threw a lofty game winning two-point conversion pass to Jordan Gilberti giving the Mocs the 29-28 victory. The two teams combined for 832 total yards with the Mocs tallying 452 and The Citadel gaining 380 total yards. Nick Tiano led the Mocs in the air completing 16 of 28 passes for 347 yards, while The Citadel was led by quarterback Jordan Back with 145 total yards. Chattanooga moves to 2-0 on the season and will travel to Ohio Valley Conference member Tennessee-Martin next week. The Citadel falls to 0-2 and will host crosstown rival Charleston Southern, the Big South preseason favorite, next Saturday at Johnson Hagood Stadium in Charleston.